SMT SMD HOT AIR REWORK SOLDER DESODERING STATION 8502Your best source for reliable DC Power Supply, call us at 408-622-9851 for product questions and ordering. For sale is a brand new, improved Model of the original 8502 2-in-1 hot aire soldering/rework station, a must-have for anyone that needs a workhorse for surface or hole mount components. 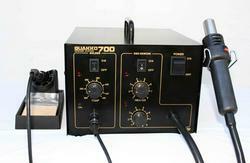 With QUAKKO 700, you get a temperature controlled solder station and rework station in one compact and convenient setup. 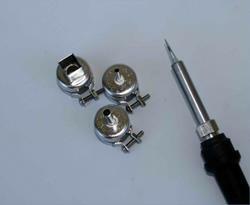 You will get a sharp-tip regular soldering iron for fine pitch chips, and 3 nozzles (instead of the original 2 nozzles) for surface mount components (see third picture for more details). The nozzles are A1124, A1130, and A1010. We also throw in the pickup tool for free! (See second picture) We also carry extra nozzles, please email us for more information or check out other items for sale. With the hot air output of this unit, you can perform surface mount rework in seconds, without damage to either components or PC boards. Just screw a nozzle onto the hot air tool, place the nozzle over the QFP, SOP, PLCC or SOJ to be desoldered, apply hot air to melt the solder without ever touching the component or PC board, and gently lift the component from the board using the included pick up wires. 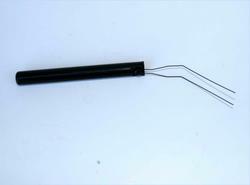 Soldering of the replacement SMD is just as easy. Other applications include thermal testing of electronic components, shrink-wrapping protective packaging, and welding thermoplastics. Station is made of metal and coated with a static-dissipative paint, so it's totally ESD-safe. This item includes 3 nozzles, additional nozzles are also available for purchase. Compact and versatile, with built in air pump, so there is no need for external compressed air source. Warranty: 1 year parts and labor. Buyers only need to contact us for service need.